Can I use non-arduino parts for this? I don’t think it should matter wether you have an Arduino Mega. The commands are send from the Raspberry Pi, no matter what device is on the other end. What is exactly the command you are sending? It looks like a digital write on pin 13 where you set pin 13 high. However in the code “000” is added to that string and not “048”. The arduino code goes on compiling for arduino mega .. Any idea where I am going wrong? Sorry Not arduino Mega, It is Arduino Due. Thank you for sharing. Your code was a great example of how to make the two devices communicate. FYI – For other newbies, The code works as advertised. However, when you restarted the I2C_Master_v0_2.py file a few minutes later, you’ll receive a polling error. It appears the Arduino is going to sleep but you will still see the arduino on the i2cbus. Restarting the arduino fixes the issue. Great work on this. Thank you. May I ask what level converter you are using between the Pi and the ‘duino? Hope nobody just connects the 3.3 v to the 5v. All that magic smoke would go away. FYI the 8-channel is not designed for this use case. I bought it off EBAY: if you search for “TTL Level Converter Adapter Module 5V-3V IIC UART SPI 4 Channel For Arduino 6Pin” you will find it. I love this blog, it has been incredibly helpful!! I do however need some advice. I have the Pi hooked up and can see the device but I also have a couple of sensors one of which cannot be seen from the Pi (i2cdetect -y 1). I have used i2c to connect to the sensors with an Arduino and have been getting good readings from them but when it comes to the Pi I can only see one. Any advice? Hello racer993 I’m very new to the raspberrpi, and arduino world. I2C between the two is something I want to desperately understand. 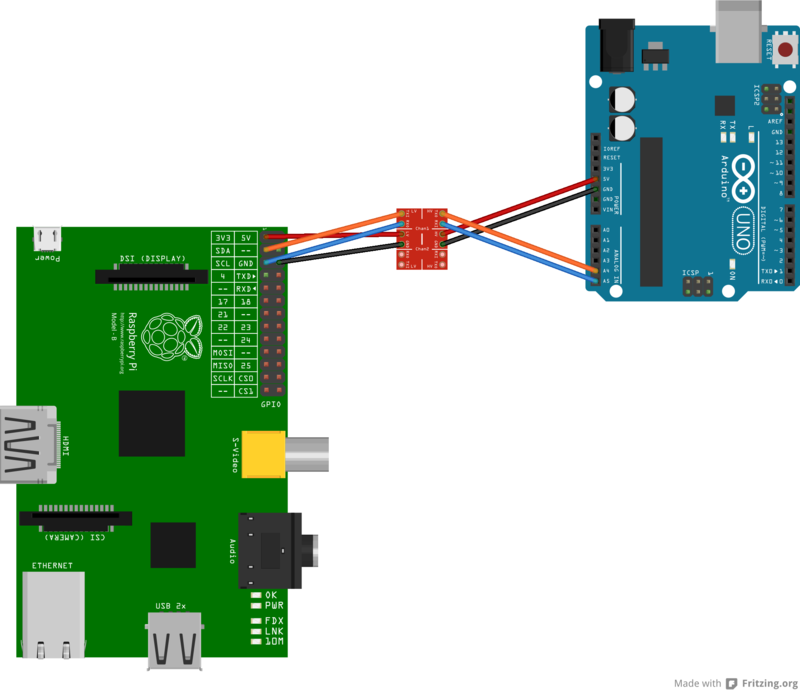 Could you send me code making the raspberrpi only blinking pin 13 on the arduino ? And another code where the raspberrypi is reading pot values from an arduino? This would better help me understand all the above.